So it’s Friday night and after a week of gruelling work at the office, it’s time to unwind. Maybe you’ll want to go out and celebrate with your work buddies. Maybe your girlfriends have invited you out for a night of debaucherous partying. Or maybe you’ve been waiting all week to see this cute guy you’ve been texting all week. So now, you’re at crossroads - trying to work out where to go to drink and dance the night away. It’s incredibly comforting to go to that one bar with your girlfriends, take in the familiar atmosphere, greet the same bartenders and sit at your favourite corner where you participate in your favourite sport of people watching. But, if you're anything like me, at some point, you feel a need to branch out and see what other fantastically fun bars Melbourne has to offer. So I’m going to try and open your eyes up to the swankiest, coolest spots in Melbourne that you’ve probably never heard of. Tucked away behind a non descript door in an alley off Chinatown, Berlin Bar feels like something out of a magical fantasy. When you go in, you have to choice to either spend the night in run-down grungy East Berlin or grandiose and flashy West. Everything from the music, furniture and ambiance is designed to replicate the conditions during the cold war. So you actually get two bars in one! Incredibly tasty cocktails made with incredible service. Perfect for a place to realise you’ve got nothing in common with that guy on a second date. 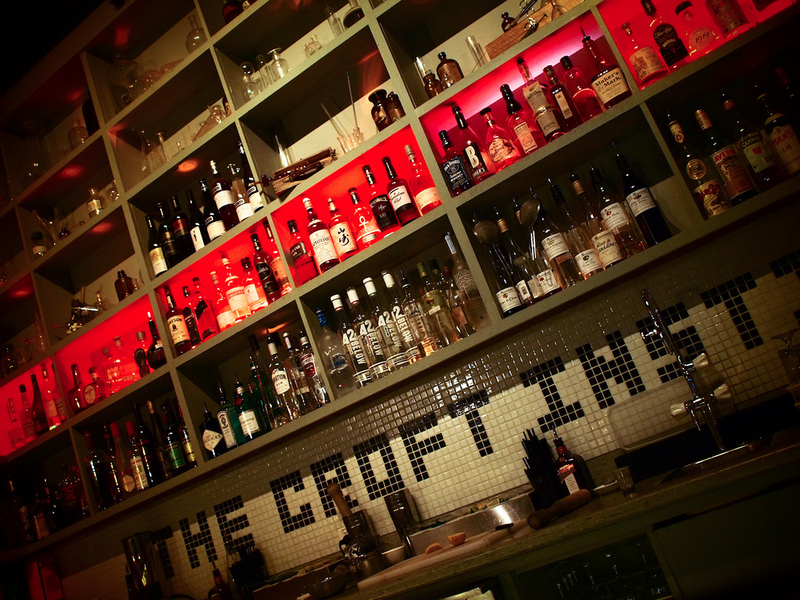 The Croft institute encapsulates the quaint Melbourne bar scene perfectly. You go down a few dark turns in a graffiti decorated alley known as ‘Croft Alley,’ until you finally get to a place that used to be a doctor’s surgery.The interior is set up like a science lab with lab stools, test tubes and drinks served in syringes! Upstairs, there is more of a creepy vibe with stretcher beds, a wheelchair hanging off the ceiling and a flickering TV! This place is perfect for an eerie night out after watching a horror movie. If you’re really up for an adventure, make it your next mission to find this bar. The only way to get here is to enter through the toilets of a restaurant called ‘State of Grace’, where you must then pull a secret book off a shelf to reveal a hidden sliding door. How do you know which book is the right one? Well, you have to work that out for yourself! With its European style, exquisite cocktails and underground location, Fall from Grace makes you feel like you’re part of a James Bond film. Flipster's glimmering Coco Flats black really help you blend in alongside the stylish cocktail enthusiasts. Hihou is a Japanese word that means ‘secret treasure.’ It’s easy to miss this place as it’s completely unmarked and requires you to ring a unremarkable doorbell. My friends and I had to look behind random dumpsters and meander through countless alleys to find this place. But it’s all worth it though. There’s an incredibly beautiful minimalist Japanese interior lit by flickering candles. It offers an intimate Japanese experience with an extensive range of Japanese whiskeys, oriental decoration marked with the absence of loud blaring music you’d typically find at other bars. There’s nothing more satisfying than sipping warm Japanese Sake while reclining on the super comfy cushions talking the night away. The Eau de Vie is as hidden of a bar as you can get! There’s no sign, just a random back alley door. You’ll probably walk past it a few times the first time you try and find it. It definitely lives up to its reputation as Melbourne’s best cocktail bar with most of the staff and drinks having won numerous awards such as Melbourne’s best bar team and best cocktail list. Upon stepping in, it feels like you’ve gone back in time to the jazzy underworld of the 1930s complete with old fashioned drinks, swing music and a collection of over 700 spirits! If you want whiskies that are nearly impossible to find in Australia, consider spending a night in Boilermaker house. It takes you back to the prohibition era vibe. Boilermaker house is beautifully laid out with a rustic atmosphere with decorations ranging from scuba diving equipment, old books and tobacco tins. It’s exactly what a whiskey bar should be, boasting over 800 drinks. You can opt to make your own Boilermaker (a shot of whisky with one pint of beer) or choose from a standard selection. Asian beer café, or more fondly known by its anacronym ABC, this place is always a good place to kick back after work. I especially enjoy chilling out at the rooftop section of the bar where I can observe people walking along Swanston Street – arguably Melbourne’s most recognisable street. The cocktails are delicious and the food contains fusion of East Asian flavours. If you’re simply looking for a relaxing chilled night out sipping on their signature long island drink, ABC is the place to be. Make it your mission to go to all of these. Bonus points if you can do them all in a month! I’m definitely going to return to these places again!